We are linking up with Treasure Junki, a UK based vintage retailer. Treasure Junki focuses on bohemian styles from the 60’ & 70s providing statement dresses, jackets & accessories that are a rarity of today. 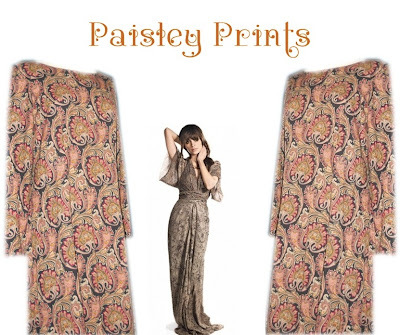 NRichieNews and Treasure Junki are giving you the chance to win this beautiful vintage paisley Print maxi dress .. we could totally imagine Nicole Richie to wear this dress with layers of jewels, grecian sandals and loose wavy hair. 1. LIKE/FOLLOW Treasure Junki on either Facebook or Twitter. 2. Tweet or write on Tresure Junki Facebook Wall " I have entered for my chance to win a vintage inspired Nicole Richie dress from @treasurejunki & @nrichienews http://bit.ly/HuSlQP "
3. Comment on this blog post with what you would pair with the vintage paisley print maxi dress and also a link to your tweet so we can see your entry. If you entered via Facebook comment with your email address & name so we can find your Facebook entry. You must complete 1-2-3 for your entry to be valid. This competition runs from 9th April - 23rd April, Entrants after this date will not be counted. One entry per person - double entries will be deleted. The winner is chosen at random using a random number generator. The vintage paisley dress is a sizes S/M which makes it quite a free size between a UK sized 8-12. This competition is open worldwide - GOOD LUCK! I would pair the dress with a great 60ies up do. Like Nicole wore her hair to the Globes... the dress is already a statement itself! Thank you for sharing this wonderful opportunity! I would wear my Sam Edelman Fringe booties, St. Eve Triangle Necklace, and Cheap Monday triangle ring. 1. Pinky Sade - Sent friend request to Treasure Junki on Facebook. 3. I'd pair some bold earrings with the vintage paisley print maxi dress! Thanks! I think i would wear some tan boots that come up to my calfs, i would wear my hair scrapped back i8nto a loose bun and then wear some feather earrings with a matching long necklace, and then wear my turquoise blue ring. I have these platforms black suede wedges that are screaming to be worn with these. As for jewelry, I'd keep it simple. Maybe just a HoH headpiece? :) Thank you for the giveaway! I would pair this dress with a tan and gold belt to cinch it in at my waist, my House of Harlow 1960 long necklace, large floppy hat, and my tan American Outfitters criss-cross flats. i would wear this dress with my gold Alex and Ani bangles and gold wedges or burnt orange gladiator flats. i LOVE this dress! my name is Alicia Merrill and my email address is alicia.a.merrill@gmail.com.